Have you been searching for that perfect Window Treatment? Cellular window shades may be just what you are looking for. Cellular Shades also known as Honeycomb Shades will spruce up any window in your home by adding a soft pleated look at the window. As an added bonus Cellular Shades by design will substantially increase the energy efficiency of your windows. How can you beat that? A window shade that beautifies your windows and saves you money on your energy bills is almost too good to be true. Cellular shades come in many different cell sizes and colors and offer many different options. There are single cellular shades and double cellular shades, small size pleats and large size pleats. Choosing a cellular shade that is right for you is a personal decision. Don’t be confused by the variety of cell sizes and colors, or if the shade is a single or double cellular shade. The correct choice when selecting a cellular shade is what looks best to you on your window. Remember, we are decorating your windows and what looks good to you may not look good to a friend or family member. Decorating your windows is a very personal decision and there is no right or wrong choice. If you like what you see next to the window, then it is the correct choice for you. The energy savings you receive from these shades can be considered an added bonus! There are many different options available when purchasing cellular shades. They are, Light Filtering, Room Darkening, Top Down Bottom up, Cordless Lift, Continuous Cord Loop, Specialty Shapes, Skylight Shades, Two on one headrail and Comfortrack side track system. 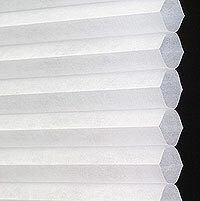 Light filtering cellular shades are the most commonly used fabrics. They are often considered semi-opaque which means they emit a soft glow at the window while maintaining your privacy. Light filtering fabrics offer 100% privacy while allowing filtered sunlight to enter the room safe from damaging UV rays. Room Darkening cellular shades are perfect for those areas of the house that require total darkness. Bedrooms and media rooms are a good example of where room darkening shades work best. These shades have an added layer of silver mylar adhered to the interior of the cell or “honeycomb” that blocks light and is not visible once properly installed in the window. Usually white to the “street side” these shades like all cellular shades offer a clean uniform appearance from the outside of the house as well. If you choose the top down bottom up option then you will have purchased a shade that is like two shades in one. A top down bottom up shade can be operated two ways by use of two lift cords, first the shade can lift up from the bottom as a standard shade would and second the shade can drop down from the top while the bottom of the shade remains closed. Top Down Bottom up Shades are a great choice for windows that require additional privacy such as bathroom windows. 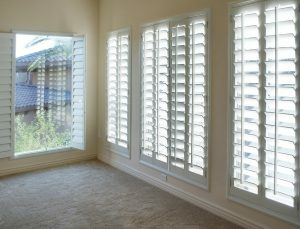 By lowering the shade down from the top you can maintain your view to the outside while maintaining your privacy inside. Cellular shades made with the cordless lift option are the perfect choice for keeping your home child safe. Cordless shades operate with the gentile push or pull of the bottom rail, eliminating the risk of strangulation to young children. No dangling cords, also adds to the clean uncluttered look of cordless shades on your window. If you wish you can have the best of both worlds by selecting the cordless top down bottom up option. For large cellular shades there is the continuous cord loop option. This option is specifically designed to lift and lower large heavy shades (usually wider than 72”) with ease. By pulling a continuous cord loop the string maintains a constant length while lifting and lowering your shades. The cord loop can be used for shades of all sizes and the cord loop should be firmly attached to the inside casing of the window or side wall for child safety. Thanks to the flexibility of the cellular shade fabric, Cellular Shades can be made to fit most specialty windows. Specialty windows are those odd shaped windows such as, ½ circles, circles, angle top windows and skylights. Specialty shaped Cellular Shades can be made to fit almost any window in your home. It is important to note, that not all specialty shades are functional. It is important to ask before you purchase a specialty shade if it will be functional or stationary. For larger windows where one shade may not be possible the two on one headrail option is available. This option allows for 2 shades to be share the same top mounting rail. It allows for a clean uniform look at the top of the window and for easy installation of two shades hanging side by side. When mounting two shades on one headrail it is important to specify the size of each shade, they do not have to be the same size but must add up to the overall width of the window. Comfortrak plus energy saving cellular shades offer a side track system that seals off the gaps between the edges of an inside mounted shade (not available for outside mount). The side track creates a barrier against cold air drafts in the winter and cool air escaping in the summer. As an added bonus homeowners qualify for a 30% tax credit up to a maximum of $1,500.00, when they insulate their windows with the Comfortrack plus energy saving sidetrack system. Cellular window shades are one of the most versatile window coverings on the market today. Once reserved for the high end decorator these shades are now available to all, and offer a great bang for the buck!